Homemade cinnamon graham crackers topped with PHILADELPHIA Cinnamon Snack Delights. The perfect pair! I have a list of food that I want to make. Homemade tortillas, cheese crackers, pita bread, bagels and pretzels are all on that list. I have now scratched graham crackers off my list. Once you make and eat a homemade graham cracker, you may never want to buy store bought grahams ever again. I wish I had saved some of these crackers for s’mores, but I couldn’t stop snacking on them. Speaking of snacking, PHILADELPHIA has challenged me to enjoy 100 days of afternoon snacking delight. I tend to not think about what I nibble on in the afternoons. A cookie here. A handful of carrots there. But with this challenge, I’ve thought more about how I eat. And eating delicious foods is of course high on my list of to-dos. Have you tried the new PHILADELPHIA Snack Delights? I am officially in love. Especially in love with today’s flavor: Cinnamon. This one may be my very favorite. Maybe. How about you all try them and let me know your favorite way to snack!?!? 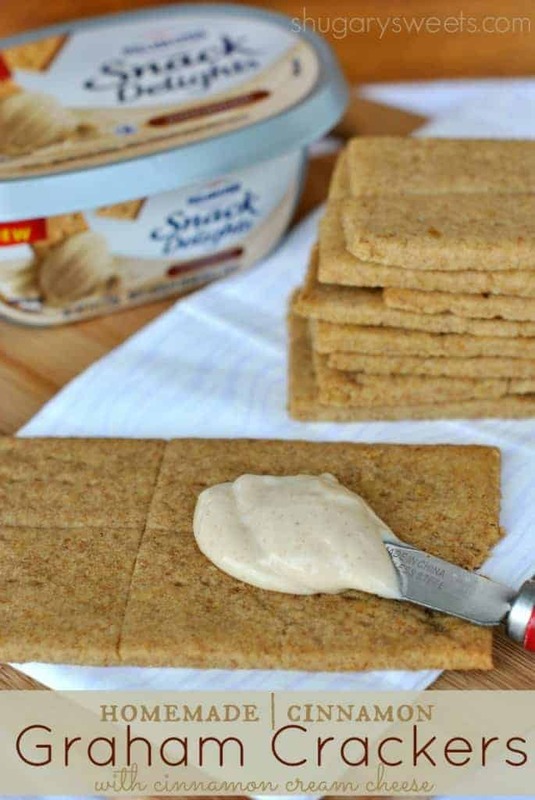 In the meantime, try making some homemade Cinnamon Graham Crackers. Thanks to Martha for this delicious recipe! The only thing I did differently is I baked my grahams a bit longer. I also didn’t make mine nearly as perfect and pretty. I even baked up my scraps and ate those too! Now I need to try a chocolate version of this recipe! In a medium bowl, mix flours, wheat germ, salt, baking soda and cinnamon. Set aside. In a mixing bowl, beat butter, brown sugar and honey until pale and fluffy, about 2-3 minutes. Add flour mixture and mix until combined. Turn out dough onto a pastry mat or counter top that has been sprinkled with flour. Divide dough into fourths. Roll out each piece between two sheets of parchment paper, into rectangles. Make sure dough is about 1/8inch thick (otherwise it bakes to more of a cookie than a cracker). Cut dough into graham cracker sized rectangles. Repeating until all dough has been used. Stack parchment paper and dough on a baking sheet and chill in freezer until firm, about 20 minutes. 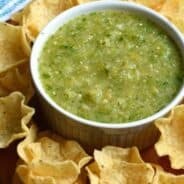 Looking for more PHILADELPHIA Snack Delight recipes? 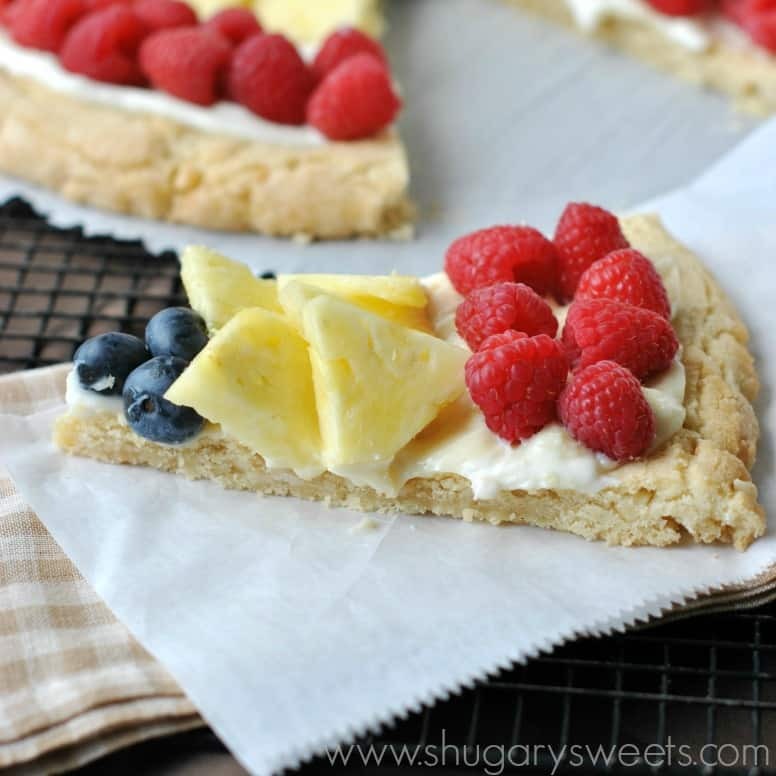 This Macadamia Fruit Pizza is delicious. No other words necessary. The White Chocolate Snack Delight is a scrumptious spread! Two ingredient S’mores Cheesecake Dip is a quick and easy snack. Dessert. Breakfast. Dinner! Mmm yum! These look great! I love making grahams! I love that there’s whole wheat in these! Graham crackers have been on my to-do list for a while, too. Can’t wait to conquer them! wasn’t “national cheesecake day” yesterday? they had someebody from “kraft” (to represent “philly” cream cheese) on my local news @noon. also, the “chew” had a “cheese” topic’d episode. so why didn’t you post this yesterday? Love this! I have seen recipes for graham crackers before but never with this amount of wheat germ…it’s like a boost of healthiness to go with the goodness of the graham cracker. 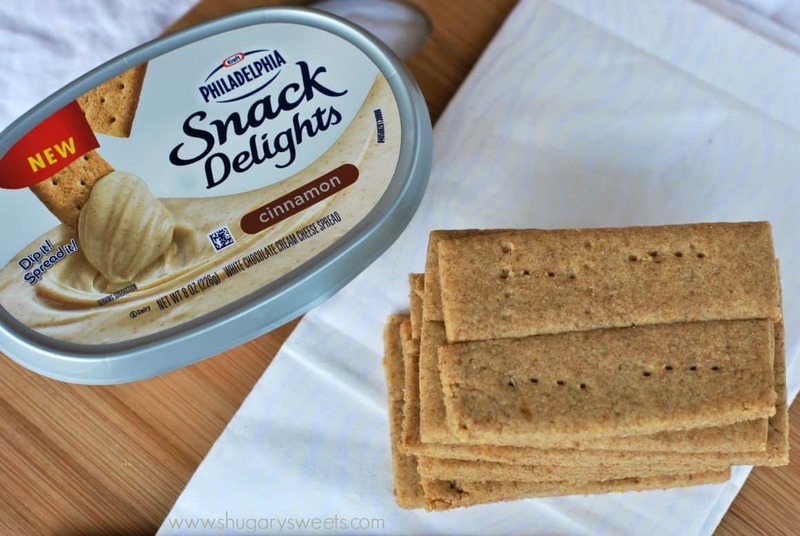 I haven’t tried the Philly brand of cinnamon cream cheese (going to now!) but I have tried the Laughing Cow brand…it’s so good! Homemade graham crackers!! How fun! These graham crackers look so tasty! Yummy! I love homemade graham crackers!!!! 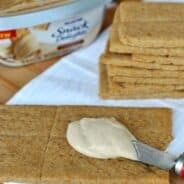 Homemade graham crackers are on my list of foods to make at home! I’ve been trying to find a recipe for ages, so I’m happy to see this. These look like they came from a box from the grocery store! Love these homemade graham crackers, Aimee! I bet these would make killer s’mores! I haven’t tried the snack delights yet. We always have cream cheese in the house, and we do use flavored varieties between graham crackers…so good! 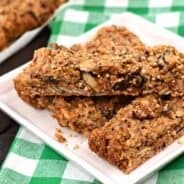 I love the idea of making homemade grahams and will get to it soon! Looks delicious! I can’t believe how easy these look! I always avoided them because I thought they required fancy ingredients or something. Oh, I LOVE graham crackers! Cinnamon happen to be my favorite, and one of my absolute fave snacks is cinnamon grahams shmeared with peanut butter! SO yummy. I swear you would fit in around here. Many days grahams and PB are my kids “sandwiches” for lunch! I read a book about a month ago The Blue Bistro, and the chef in the book makes homemade crackers. Its a huge deal. I totally wanted to make them after reading the book. I’m definitely going to have to try these now. I’ve only made homemade graham crackers once and they were gluten free and I loved them. I’m sure I would love these even more! Yum! 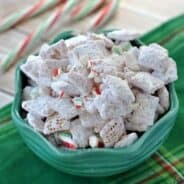 I have had homemade graham crackers on my list forever! This recipe looks great Aimee! And pairing it with the Philadelphia is perfect! Thanks Liz, they were much easier to make than I thought! Next up: cheese crackers! this looks so good! I love the Philly cream cheeses! Such a genius product. 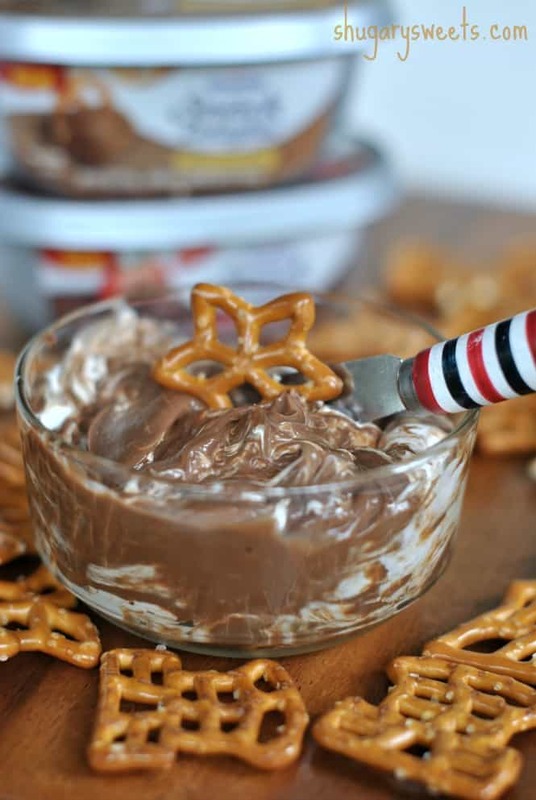 I also clicked over to your 2 ingredient S’mores Cheesecake Dip – OMYWORD! you are speaking my love language right there! Aww, thanks so much for the sweet comment girl!! I love homemade graham crackers! I bet they taste amazing covered in cinnamon cream cheese! How did I miss this post? Oh my goodness. All I can say is, wow. Wow. These look like… amazing. Seriously. I adore cinnamon. And graham crackers? This might sound kind of weird, but I think they’re better than cookies. Warm homemade graham crackers? Oh my gosh. Graham crackers are a serious addiction of mine. They last about 2 seconds in front of me. What a great way to save some money by making them at home!